PHOENIX — Every year, hundreds of unwanted pet turtles are released into the lagoon at Phoenix Zoo and at other community lakes all over Arizona by their owners. From Friday, May 18 until Sunday, May 20, visitors to the Phoenix Zoo (and other members of the public) can watch wildlife management in action and learn about responsible pet turtle ownership. Arizona Game and Fish Department biologists will be working in the lagoon outside the zoo’s main entrance to lure turtles into baited hoop nets. 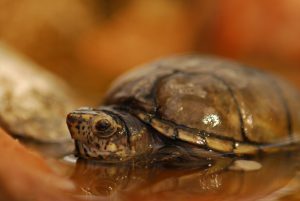 All female nonnative turtles will be removed from the pond and placed with the Turtle and Tortoise Preservation Group — reducing population growth and preventing nonnative species from traveling to nearby waters where they could spread disease to or prey on native turtles and other native aquatic wildlife. World Turtle Day this year is Wednesday, May 23. The Arizona Game and Fish Department needs your donations to conserve and protect Arizona’s 800+ wildlife species, including native turtles. The department receives zero Arizona general fund tax dollars, and existing funding often isn’t sufficient to cover conservation needs. You can help by making a donation at www.azwildlifehero.com.